‘Got money, will spend.’ Well you will need to have a lot of money to afford the latest offering from Ducati, with a price tag of £60 000, the Superleggera Panigale is £33 450 MORE expensive than a standard Panigale R. Wow. The reason for the price tag is that the Superleggera comes equipped with a WSBK derived electronics package and the monocoque chassis is made from special lightweight magnesium. This all means that the Superleggera weighs in at 180kg fully fueled and ready to go. At that weight, Floyd Money Mayweather will start shivering. However, you would also need to have the middle name ‘money’ if you were to purchase this bike, but we will see it compete in the superstock class. Tired of seeing Ducati’s flaying by the wayside? Well they are on their way back to the podium, a place that has been elusive of late. 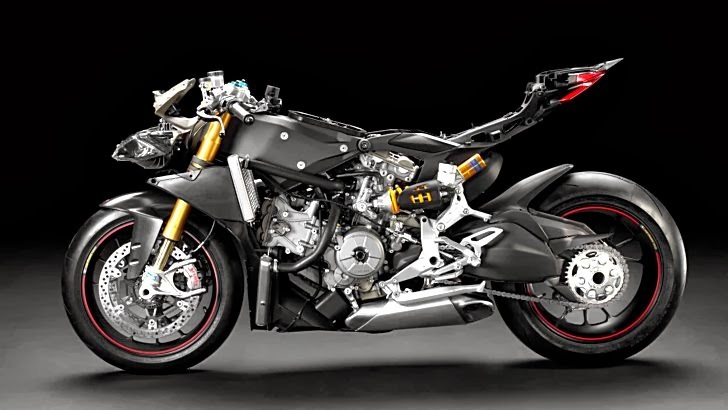 If your name is Troy Corser and you are fortunate enough to win the lotto and decide to purchase one of these monsters, you will also receive 200bhp at the crank, an abundance of carbon fibre, and 15kg less than the Panigale R.
A few of you may also remember the £80 000 Panigale RS, however the RS will not be seen on the road as it is only for racing teams, whereas the Superleggra may be spotted on the road, although we will see it first in Superstock I suspect. Ducati has produced yet another highly desirable superbike that many of us want but there is a catch, the Superleggera is invite only. Just like the Ferrari Enzo and LaFerrari. Commence crying now.